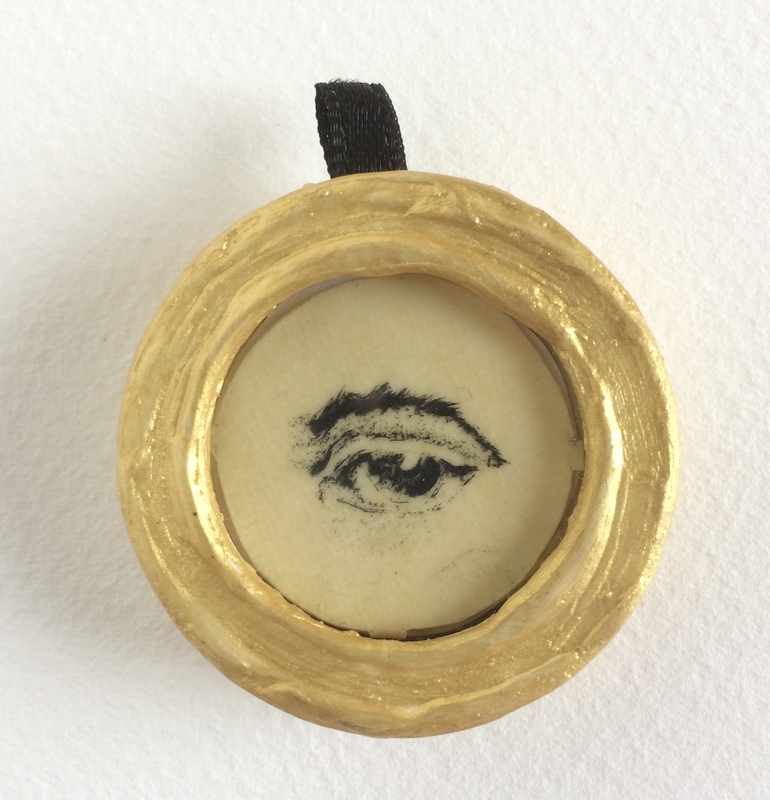 Miniature eye portraits are a rather obscure phenomenon of the late 18th century and early 19th century, and their history is even more curious. For that reason, the photo-etched poem, to be read clockwise from the title, may seem entirely cryptic, necessitating a brief explanation. Supposedly, the first eye miniature in England was commissioned by Mrs. Fitzherbert, to be painted by Richard Cosway as a present for the Regent Prince. In return, the Regent Prince presented her with a ring containing a portrait of one of his eyes on her next birthday. 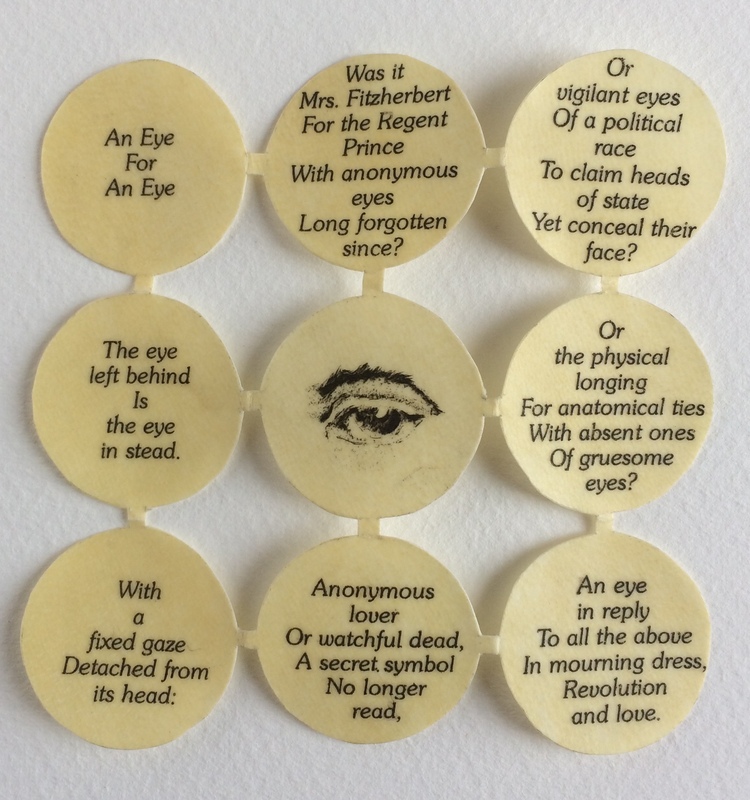 This represents the genre of eye portraits adopted as tokens for lovers, eyes revealing their true identities to only a select few, and often remaining anonymous in posterity. In that way, sweethearts were reminded of their lovers’ ever watchfulness. However, some artists, such as Sir Gardner D. Engleheart, painted eye portraits for many members of the same family, and at times both the right and left eye separately. Perhaps these curious mementos served years later, in moments of mourning. Occasionally they contained human hair in a separate compartment. The “vigilant eyes of a political race” refer to the eye portraits in France, which functioned as a recognizable but discreet symbol facilitating meetings between unacquainted members of the revolutionary party. 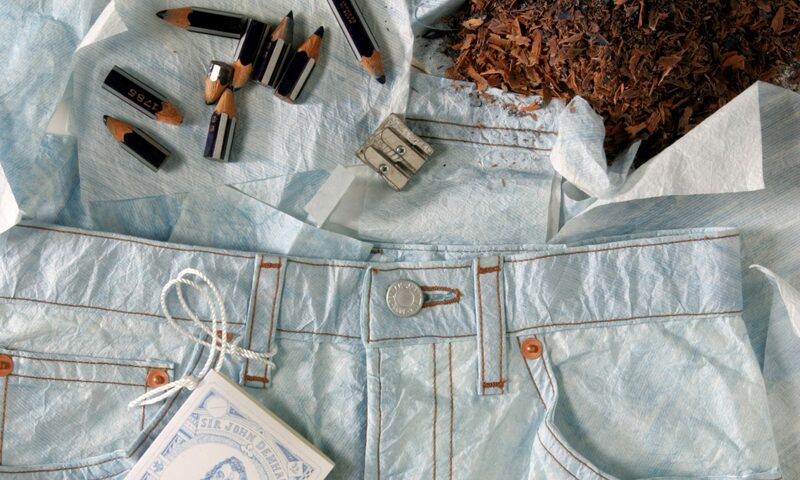 These eyes were painted on small trinkets that might easily be seen, such as snuff boxes, brooches, lockets, and rings. To disguise the political significance, the eyes were actual portraits as opposed to a standardized eye In this way, the adherents to the revolution masked their identities while plotting to claim power. Not only the revolutionaries remained anonymous. The artists’ identities are also an enigma, as very few eye miniatures have ever been signed. Part of this must be due to the diminutive backgrounds, but in the case of the French portraits, there were political reasons as well. The eye portraits have been criticized for their anatomically-correct appearance, complete with bloodshot veins. In that the eye is detached from the face, showing only contiguous flesh and perhaps eyebrows, hair or even clouds, some authors remark that the eyes resemble those of a fish rather than human eyes. Out of context, the eyes might repel some viewers with their cold stares. But for others, these curiosities inspire affection and remembrance of loved ones, alive or deceased, in the case of portraits worn as mourning buttons. The detached eye serves as a proxy for the whole person, symbolically reduced to a vigilant stare. Produced in an edition of 20 copies, representing the standard measure for vision, on a single piece of vellum cut to form nine circles folding into one behind the eye. The eye rests on a black satin cushion with a ribbon tab in a gold box, with a cover resembling a round gold picture frame in acrylic gesso. The tab facilitates the opening of the box, or it may be used to thread a cord that could hang from the neck. Etched eye and photo-etched text printed on vellum by Giorgio Cardarelli of Stamperia Bentivoglio. The text reads clockwise from top left.